Keywords: Rodent, Survey, Food Consumption, Food Contamination, Poultry Farm, Animal farm and Stores. 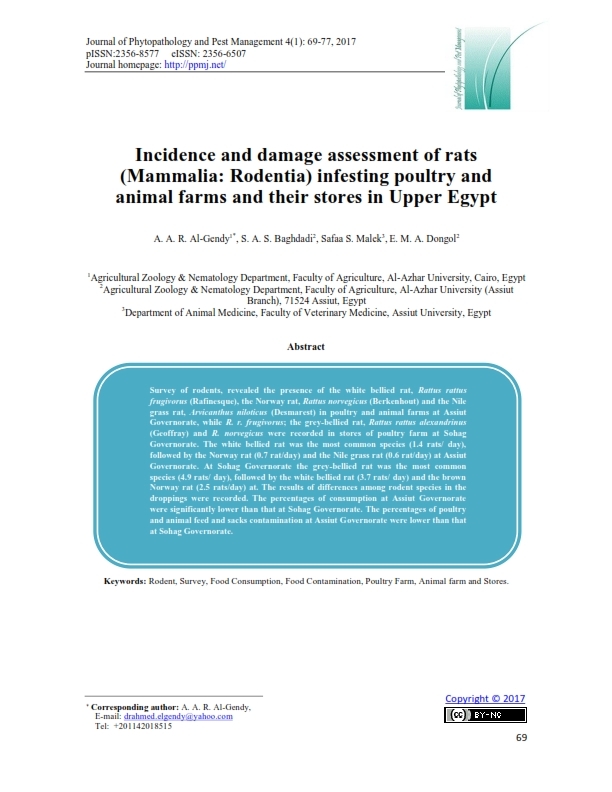 Survey of rodents, revealed the presence of the white bellied rat, Rattus rattus frugivorus (Rafinesque), the Norway rat, Rattus norvegicus (Berkenhout) and the Nile grass rat, Arvicanthus niloticus (Desmarest) in poultry and animal farms at Assiut Governorate, while R. r. frugivorus; the grey-bellied rat, Rattus rattus alexandrinus (Geoffray) and R. norvegicus were recorded in stores of poultry farm at Sohag Governorate. The white bellied rat was the most common species (1.4 rats/ day), followed by the Norway rat (0.7 rat/day) and the Nile grass rat (0.6 rat/day) at Assiut Governorate. At Sohag Governorate the grey-bellied rat was the most common species (4.9 rats/ day), followed by the white bellied rat (3.7 rats/ day) and the brown Norway rat (2.5 rats/day) at. 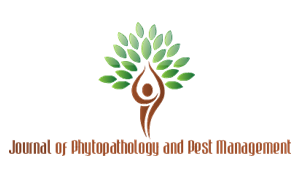 The results of differences among rodent species in the droppings were recorded. The percentages of consumption at Assiut Governorate were significantly lower than that at Sohag Governorate. The percentages of poultry and animal feed and sacks contamination at Assiut Governorate were lower than that at Sohag Governorate.